Hollowdog is an Oregon original rock-n-roll band based in Portland. Their music is an eclectic psychedelic fusion of music inspired from the 60s and 70s with a modern dash of the Northwest Indie vibe. Hollowdog plays what they feel, with each member imparting his own narrative to complete the final arrangement. You can hear and feel these influences in both the original music they create and the covers they play. Growing up in opposite ends of California, Hollowdog's principle songwriters Rich Norkunas and Jon Martz reflect that esthetic. Rich's musical DNA is steeped in the Southern California sound of CSNY, Jackson Browne and the Byrds while Jon's music has it's roots in the Grateful Dead, Hot Tuna, Sons of Champlin and other Bay Area Bands. In the ensuing years, both Jon and Rich expanded their tastes to everything from jazz to reggae. 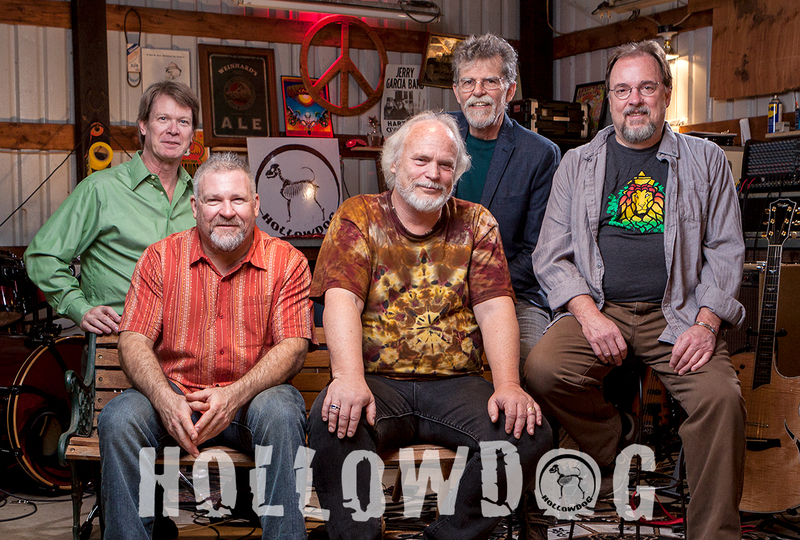 These eclectic influences when combined with their band mates, Robert Sanders, Chris Widenhofer, and Scott Sobel, create a distinct musical lineage to produce Hollowdog's slightly familiar but totally original sound. Warning: Hollowdog's original songs and unique covers, may induce severe dancing and fun!